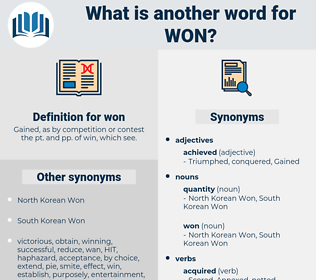 What is another word for won? Gained, as by competition or contest the pt. and pp. of win, which see. triumphs, defeats, hits, leads, gets, makes. Bodies, patterns, Euros, Prices, Koreas, kyats, yuans. obtain, Obtaining, attained, regained, clinched, defeated, Investigated, finished, increased, consolidated, retained, Began, joined, qualified, owned, acquired, enlisted, Prevailed, vanquished, Generated, overpowered, no., bet, dominated, inherited, determined, presented, experienced, derived, described, appreciated, swept, crowned, invited, elicited, Caught, GONNA, recorded, received, Overcame, Delivered, warranted, Scored, recovered, fulfilled, save, removed, Trounced, engaged, lost, Undertook, Enjoyed, Brought, Procured, Purchased, Issued, realized, Fought, contracted, arranged, imposed, gathered, collected, Wrangled, seized, found, Snatched, approved, Succeeded, drew, Managed, conferred, Grew, Struggled, Attracted, developed, reopened, access, accessed, Arrived, deserved, Yourself, ensured, Captured, Performed, Became, supported, secure, secured, occupied, Resulted, registered, Provided, downed, opened, produced, selected, completed, acquis, rose, assumed, learned, saved, Suffered, command, Commanded, Rallied, Returned, Blanked, accepted, spread, graduated, Filed, Acceded, applied, favour, merited, merits, conducted, Claimed, stole, Happened, granted, elected, Reaped, sent, Reached, raised, Occurred, attended, struck, ali, Yielded, Came, PW, failed, Was, Were, Carried, pursued, led, left, broke, sought, Visited, Died, wanted, Boarded, Killed, Caused, Grabbed, Prompted, Tended, shaved, Amounted, Scooped, Offered, Served, showed, Rated, held, tested, locked, me, hooked, forces, mounted, landed, played, Gave, Bagged, on, Accounted, expressed, posted, Bought, saw, Voted, Had, B, Passed, Took, Met, Meant, placed, Went, called, 'il, Did, 'd, made, beat. attained, withdrawn, regained, defeated, finished, witnessed, implemented, increased, identified, convinced, intensified, risen, entitled, beaten, acquired, Eradicated, trained, Prevailed, vanquished, guaranteed, benefitted, contested, accomplished, Generated, Benefited, campaigned, Administered, strengthened, determined, manufactured, presented, considered, experienced, accumulated, Retrieved, derived, undermined, GOTTA, Comprised, swept, Garnered, elicited, Caught, recognized, improved, overcome, demonstrated, recorded, advanced, infected, received, Delivered, impressed, expanded, warranted, matches, Adjudicated, Scored, restored, recovered, fulfilled, Vince, Undertaken, removed, bestowed, endorsed, engaged, convicted, lost, Enjoyed, Brought, Procured, Purchased, Issued, realized, Fought, justified, arranged, Enabled, imposed, enforced, gathered, collected, Extracted, enhanced, seized, bested, leveraged, reclaimed, found, victoria, established, drawn, approved, grown, Succeeded, Managed, conferred, concluded, Attracted, developed, realised, expired, surmounted, reopened, accessed, decided, superior, forfeited, Arrived, auctioned, deserved, become, support, ensured, measured, asserted, subdued, award, Captured, Performed, Allowed, serviced, supported, secured, composed, labeled, honoured, accrued, occupied, Resulted, registered, exploited, Provided, opened, produced, released, selected, destroyed, Assessed, filled, matured, completed, Learnt, Embarked, equipped, elapsed, assumed, learned, calculated, saved, admitted, Suffered, permitted, Commanded, hired, Returned, satisfied, Emerged, Afforded, accepted, spread, graduated, Harvested, Rewarded, applied, favour, merited, conducted, chosen, Claimed, team, moved, built, Happened, allotted, granted, Battled, elected, Reaped, sent, Reached, raised, blown, Exported, Upheld, observed, Occurred, proved, proven, Picked, struck, Been, ali, Yielded, failed, broken, Helped, Carried, washed, pursued, led, sought, Fitted, resolved, Stalled, Subjected, fallen, dropped, Killed, ranked, Caused, vested, stocked, Prompted, Polled, Pushed, sold, lapsed, Accorded, Shown, settled, Offered, Served, Rated, held, tested, force, forced, twenty, given, paid, played, treated, formed, expressed, seen, Bought, funded, Borne, Has, Had, taken, Passed, heard, Met, set, 1992, Logged, gone, placed, Gotten, done, named, made. Gained, accomplishment, Benefited, Achieved, Achieving, Garnered, conquer, conquered, team. Sir Patrick had won the day. What reason had you to strike the man who won my daughter? North Korean Monetary unit, South Korean Monetary unit.